Nixon Honey Farm is a family farm which has been in business for about 20 years. Our farm was started by my Father, Bryan Nixon. At this time, my brother Craig and I, Kevin Nixon, now operate Nixon Honey Farm. We are based in Alberta, Canada and we focus on providing honeybees for pollination of crops in Alberta as well as producing large volumes of 100% pure honey. We are a commercial honeybee farm producing approximately 500,000 kg of honey per year, most of which is exported. When my father started the farm we started off as a fairly small farm company with only 400 hives of bees, today we operate many thousands of hives. We remain a family company and we also have 20 employees during the production season. When we first started our farm, our honey was generally sold to packaging companies either in Canada or in the United States. We also package a little bit for local/domestic sales as well. As our company has grown and we have large volumes of honey to sell, we needed to investigate new and growing market opportunities. Over the past number of years, Japan has been the second largest export market for Canadian honey. For this reason, it made sense for us to investigate the Japanese honey market further. We are fortunate here in Alberta to have a provincial government office which is dedicated to advancing the trade relationship with Japan through the Alberta Japan Office with representatives both here in Alberta as well as in Tokyo. Through communicating with the trade office, Nixon Honey Farm was able to participate in a trade mission to the Osaka region as well as Tokyo. By doing this, we were able to directly meet and communicate with potential customers. It was at this point where things fell into place for us to begin exporting directly to Japan. Our customers have subsequently visited our production facility here in Alberta and we have continued to return to Japan to visit our customers. It is an honor and a privilege to be able to be a honey supplier to the Japan market and we look forward to continue and grow our export business with Japanese customers and build relationships for the long term success for everyone. We look forward to being a member of The Japan Society and learning more about the organization. Canadian electricity and gas provider Just Energy ventures into the recently deregulated Japanese market. The Japan Bowl is a Japanese language competition created by the Japan-American Society of Washington DC in 1992. It uses a quiz bowl format to test the knowledge of Japanese culture, society, daily life, history, geography, and current events. This year, for the first time ever in Canada, Ontario Japan Bowl took place on November 2, 2017 at Huron University College in London, Ontario. The event was held as a trial during the school cultural event “Japan Day.” It brought together some 100 guests including university students, faculty and local high school students. 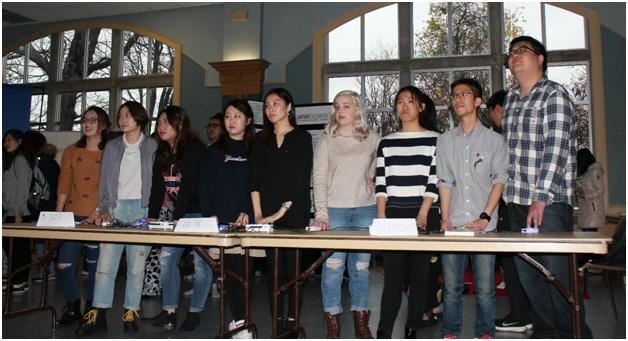 The audience enjoyed the team-match which consisted of three representative teams from Huron senior Japanese language students. The event was very successful and participants enjoyed it. Here are some students’ comments. It's truly believed that the Japan Bowl will encourage young people to study Japanese language culture and this will help the Canada-Japan relationship eventually. The first Ontario Japan Bowl will be held in March 2018. Question: In Japan’s medieval period, what title was given to the supreme ruler of the military government?